Father Gabriel, did you attend prior youth conferences? Please tell us what impressed you the most, and what you would like to tell those who did not attend. I did not attend the first “Orthodox Youth Fellowship” conference. I was a participant at the second conference, and this year I headed the ROCOR delegation. Matushka and I were greatly impressed over the course of the whole conference: What remarkable, talented young people! We could feel their spirit, enthusiasm, and proper attitude. Orthodoxy is in good hands. And how the youth performed, how attentively they listened in at spiritual discussions! It was clear that they were taking an interest. Even those young people not necessarily fluent in Russian stood up and asked questions. And this is important, as it means that today’s youth is concerned with the issues being discussed – they aren’t indifferent, and they take these and other problems seriously. The conference’s was planned very well and was productive. Attention and gratitude for this are due to Sergei Pavlovich Loktionov and all of the organizers of this historically important undertaking. Over the course of the conference, we grew so close that we now truly miss our new Orthodox family. How wonderful it would be if all of our youth, from Australia and around the world, could take part in these conferences. Father Gabriel, the third “Orthodox Youth Fellowship” conference was undertaken with the blessing of the upper echelon of the hierarchy of the Russian Orthodox Church – Patriarch Kyrill of All Russia and Metropolitan Hilarion, First Hierarch of the Russian Orthodox Church Outside of Russia. How did civil organizations react to the conference? Did members of the presidential administration take any part in or make any contribution to it? The president’s wife, Svetlana Medvedeva, chairs the management council of the multitier program “Spiritual and Moral Culture of the Next Generation of Russia.” Was there any support from her corner? After all, organizing a conference of this scale, attended not only by Russians, but by nationals of other Western nations, is no small task, and requires the resolution of many organizational issues. Yes, you are right; before the conference convened, a great deal of organizational work was done, and the president’s spouse, Svetlana Medvedeva, personally supervised the conference’s preparation. The “Orthodox Youth Fellowship” conference did not escape the attention of the Russian government, and was conducted with the support of the RF Presidential Plenipotentiary Envoy to the Central Federal District, Georgy Sergeyevich Poltavchenko. Wherever we went, we were given attention and care at a professional and diplomatic level. Without support from the government and cooperation in coordinating the events, many of the meetings might not have taken place. Were any functions outside of church life organized, ones that would be interesting both for Church youth and for those young people who are just making the first steps in that direction? Is being a conference delegate limited only to those young people who attend church regularly and adhere strictly to the fasts, or are there some other criteria by which one can become a delegate? How old were the conference delegates? Young people between the ages of 18 and 25, who belong to the Orthodox Church, and who have the blessing of their spiritual fathers, can become conference delegates. The goal of this project is, by way of good example, to take the first steps toward uniting Orthodox youth around the world. Morality is the first and most basic thing that delegates of an Orthodox conference should possess. Entering into an atmosphere of right-minded, positive youths, here everyone can become a part of this community and, following the example of his peers, can quickly internalize the norms of Church etiquette… Along with the conference delegates, we attended various non-church events, which were just as beneficial. At Mosfilm Studios, we met with director Vladimir Khotinenko and representatives of Moscow’s universities. 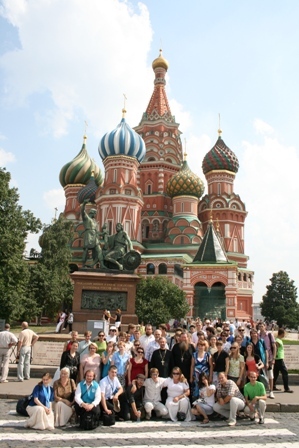 What historic sites relating to Russia’s history outside of Russia did the youth visit? Were they able to attend church services and meet with representatives of ROCOR’s Russian clergy? Every tourist who comes to Paris visits one of the largest art museums in the world, the Louvre, as well as the Notre Dame Cathedral, but not every tourist – or even every Parisian – knows that the most important thing in Parish is hidden from sight. Even those who know of it might not have the opportunity to see it. Since the 13th century, one of the most important Christian relics has been kept in Paris – our Savior’s Thorny Crown. Did the Lord deign to reveal this holy relic to you? While in Paris, we did not have a chance to visit the Louvre, but we did visit other places. The most important event for us was the opportunity to serve a private moleben before our Lord Jesus Christ’s Crown of Thorns. The Lord deemed us worthy of the miraculous opportunity to serve a moleben before the holy head of St. John the Baptist, to sing the troparion and megalynarion before the relics of the Holy Empress and Equal-of-the-Apostles Saint Helen, and the Holy Myrrh-Bearer Mary Magdalene. These were unforgettable moments. If I could, I would bring all of Australia’s Russian youth there. It bears mentioning that the third international conference included a comprehensive program that also included a concert by participants in honor of the 65th anniversary of Victory in the Great Patriotic War. The young men and women organized presentations of their various artistic talents. These included songs and poems, discussions and skits. The presentations and concerts were so lovely, that at times it seemed as though it wasn’t youth performing, but professional artists. These young people approached everything with the utmost responsibility. When they were in Orthodox monasteries, they took active part in the divine services, undertook laborious obediences, and actively participated in meetings with clergymen and professors of Kursk’s Diocesan Theological Seminary. What remarkable youth. The future is theirs. Father Gabriel, we could see in your slides and photographs how wonderful the youth looked at the conference. Aside from how beautiful they all were in their youthfulness, we felt as though the conference delegates lived in one spirit, and their light blue vests made them seem as one all the more. Who designed the delegates’ uniforms and the conference’s flag? 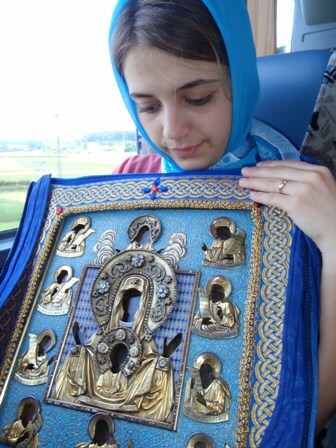 The flag’s designer was Archpriest Alexander Filin of the Kursk Diocese and his Matushka Svetlana. They are also the designers of the vests and the scarves, which we specially ordered for the conference delegates. The vests were sewn from a light blue fabric – the favorite color of the Mother of God – and wonderfully adorned our youth. For the entirety of the conference and during all of our trips, we could see our youth from afar off in their light blue vests. In the midst of large crowds, the Fellowship delegates seemed as droplets of holy water, which had fallen into their youthful souls as a sprinkled blessing, sparkling with the rebirth of Russia and Orthodoxy. Father Gabriel, are there any preliminary plans for where the next “Orthodox Youth Fellowship” conference will be held? Next year (2011), will you be choosing altogether new delegates, or will the issue of who is a delegate be decided in another manner? Do you have any of your own proposals for how the delegation should be composed? As far as where the conference will be held, that has already been decided. In addition to Russia, delegates to the fourth conference will visit the Crimean peninsula and Italy. The delegates will be the same, by and large, as this year. Each delegate has the option to attend a second conference. We decided to do this so that new delegates could more easily become acquainted with the work and more quickly begin to participate in organizational matters. As for the composition of the delegation, I will make no proposals, but have seen a good sign in the number of matushkas who attended the conference. It would be good if all of the priests could attend next year with their matushkas. Women are always more in tune with emotions and attentive to certain things that men might not notice, and this can prove very important in the process of educating our youth. Father Gabriel, how were issues relating to financing the delegates dealt with? A trip to Russia is no inexpensive matter, and the delegates are, by and large, just students. Yes, trips to Russia do prove expensive. Tickets from Australia were the most expensive. I would like to take this opportunity to that the Fund for Assistance to ROCOR for their generous help. The Fund for Assistance is based in New York and helps all Diasporan participants of these trips with grants of various sums. The amounts are determined by the distance and expenses involved in the trip. This year, the Board of the Fund for Assistance appropriated almost $20,000 for 20 people. Aid was given to representatives from Australia as well as from America, including two priests. Without their help, our Diasporan youth, and especially Australian youth, would not be able to take part in these trips.